Mr. and Mrs. Will Anderson came to Collin County from Grand Junction, Tenn in 1890. They first settled in the Sister Grove community in northeast Collin County. To this union seven children were born. Three still living. Mr. Cecil Anderson of Dallas, TX. Mr. W. F. (Andy) Anderson of McKinney. Miss Fletcher Anderson of McKinney, TX. Miss Fletcher Anderson is known for achievements both in the professional and humanitarian field. “Miss Fletcher” as she is called by the multitudes she has come in contact with, was born in the Sister Grove community in Collin County in 1902. The daughter of Mr. and Mrs. Will Anderson. Her father was a farmer, and she came from a large family and her mother early in life having been left a widow. These factors which helped to shape the tone of her life-a kind Christian lady who believes in her fellow man. Miss Fletcher’s mother was the former Ida Leah Gay. She died in June 1963 at the age of 89. The Andersons moved to McKinney from Blue Ridge in 1912. Miss Fletcher attended the first grade at Blue Ridge and she attended what is now South Ward School in McKinney. By the time she was in the fifth grade, her mother had moved and she attended the Central Ward School. She graduated from Boyd High School in McKinney in 1922. She took the State Exam for a teacher’s certificate and passed. In 1923 she attended Mary-Hardin, Baylor College in Belton, Texas – and in 1924 found her teaching school in Big Viney Grove. The next year she taught at Culleoka. Between terms she worked at J. C. Penney Co., in McKinney, Texas and finally she became a full time employee of the firm until 1937. The year 1937 was the beginning of her associating with the McKinney Dry Goods Company where she accepted a position as a Saleslady and assistant buyer. In 1942, she became manager of the company. 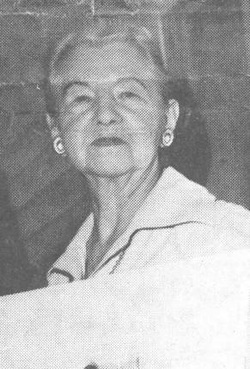 Continuing her rise in the old established business she became a substantial stockholder in 1955 and increased her holding and soon became half owner of the McKinney Dry Goods. Miss Fletcher also has interest in the Annex. By faith Miss Fletcher is a Baptist, is a member of the First Baptist Church of McKinney, in which she has been and still is most active. Here are a few of the various associations with which she has been identified with. Secretary of Young peoples department, Superintendent of young peoples department, Training Union Director, General Secretary Training Union, Collin Training Union Director, President of Business Women’s Bible Class, Chairman of Hudson Circle, Served as Trustee of First Baptist Church, served on the 21 member Building Steering committee, Secretary-Treasure for W M. U. of the church, Taught training classes for both Sunday School and Training Union over Collin County, Served over the Training Union State convention Program. Also on committees for state convention. She has also served as President of the Tyrolese Literary Club, President of the Gas Lighters Book Review Club. She was appointed to the alumni Advisory Board of Mary Hardin Baylor College, member of Collin Memoirs Hospital Auxiliary. Miss Fletcher has for years been active in McKinney Chamber of Commerce, served on Board of Directors for 4 years. Miss Fletcher is a member of Citizens’ Advisory Committee. She has recently sold The McKinney Dry Goods, the store she operated for 35 years. Ernest Anderson was married to Lola Edeless at Mead Okla.
Aura D Anderson was married to Birtha Hudson at Slick Okla.
Aurey D. Anderson was borned Oct. 31, 189?